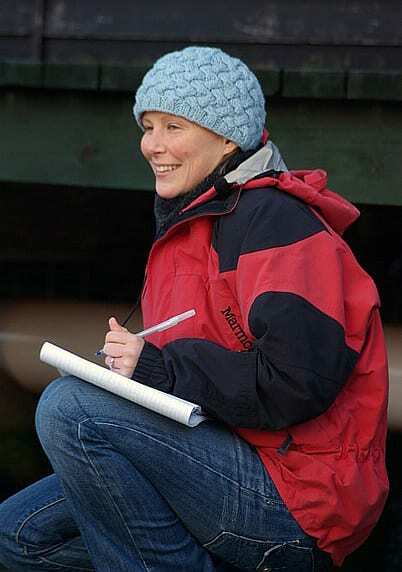 In 2003, Stacy DeRuiter arrived as a graduate student at Woods Hole Oceanographic Institution (WHOI), where a new device developed at WHOI was sparking a revolution in marine mammal research: the D-tag. The cell phone-size digital recording device—affixed temporarily (and non-invasively) to large whales—has given scientists the ability for the first time to track whale movements in the deep sea and record the sounds the animals make and hear. But DeRuiter was eager to take the next step. She wanted to use the device to study some of the smallest cetaceans of all, harbor porpoises. She yearned to unveil whether they used sound differently than whales to communicate, navigate, and hunt in shallower coastal waters. She wondered if they were finding it harder to negotiate waters that had become so much “noisier” in recent decades because of increased ship traffic, sonar use, and air guns for oil exploration. She dreamed that a greater understanding of how porpoises use sound could help find ways to balance the needs of people and porpoises in coastal waters. That next step, however, turned out to be a doozy. First, DeRuiter consulted with the D-tag’s inventor, WHOI engineer Mark Johnson. Together, they agreed that the D-tag was too big for more diminutive marine mammals and would change the way the animals behaved. Moreover, the D-tags’ electronics were tuned for the sounds made by whales, which are far lower in frequency than those used by porpoises. All the obstacles added up to a problem that seemed too hard for a graduate student to tackle. She cried. She stayed up nights. DeRuiter described the entire period as one of the most frustrating times of her life. Then DeRuiter asked herself: Why not try to make the tag smaller herself? She enrolled in a class at the Massachusetts Institute of Techonology’s (MIT) media lab called “How to Make Almost Anything” in an effort to learn the skills required to build her own tag. “I had just given in to the realization that, given my slow progress as an engineer, it was going to take me 10 years or so to build anything that was remotely functional, and was about to give up,” she said. Then, at a retreat in 2006 for students in the MIT/WHOI Joint Program in Oceanography, she met fellow student Alexander Bahr and told him about her efforts shrink the D-tag. Bahr, who specializes in navigation systems for autonomous underwater vehicles, was intrigued and offered to lend his electrical engineering talents to the mix. A winning partnership was born. 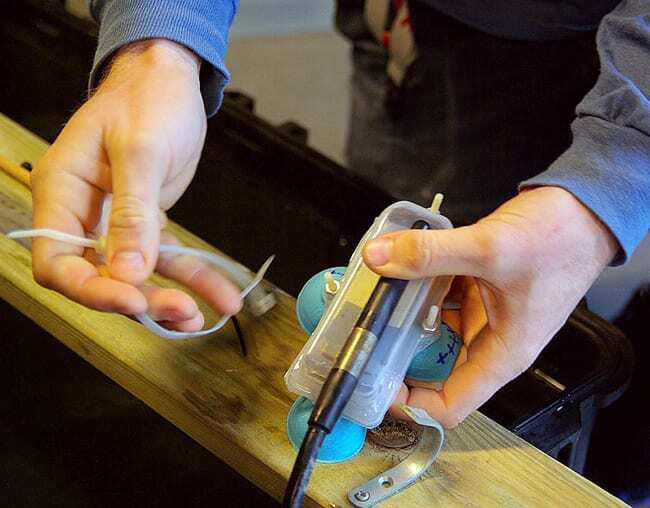 With Johnson’s blessing and the blueprints of the original D-tag, DeRuiter and Bahr spent the next few months experimenting to create a porpoise-friendly version with seed funds from the WHOI Ocean Life Institute. In labs at both Woods Hole and MIT, they spent painstaking hours redesigning a 2-centimeter audio processing board that required very little battery power to capture high-frequency porpoise clicks. Next, the tandem tackled another unanticipated challenge: getting the smaller tag to stick. The original D-tag sticks to the slippery skin of large whales with espresso-saucer-size suction cups. But DeRuiter and Bahr had to devise something smaller and less stiff to work on smaller porpoises. They tried everything—commercial suction cups, medical suction cups, even the suction cups from the bottom of standard rubber bath mats. When none of these worked, Bahr and DeRuiter modified and shrank the custom design of the original D-tag’s cups, drew up the plans on a three-dimensional printer at MIT, and built a mold. The final key was finding the right material for the cups. After experimentation, they found a soft silicone material that was sufficiently flexible and used it and their mold to cast their own suction cups. To keep the new tags small, DeRuiter eliminated the VHF radio tracking beacon and flotation equipment. 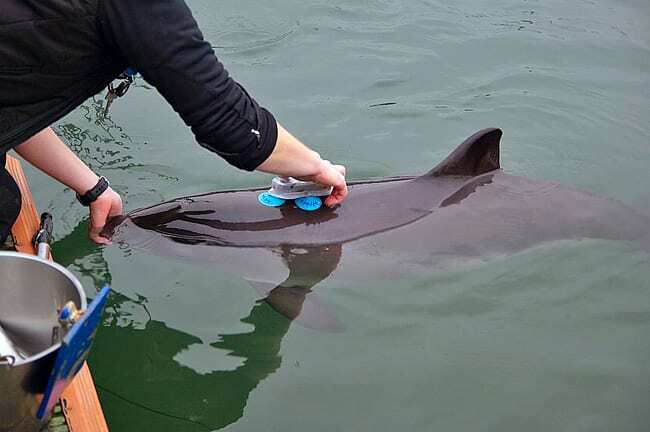 Without these features, there would be no way to retrieve the devices once they fell off porpoises, so applying tags to wild animals in the open ocean was too risky. Instead, DeRuiter decided to study captive animals in an enclosed habitat: the Fjord & Baelt Center in Kerteminde, Denmark. 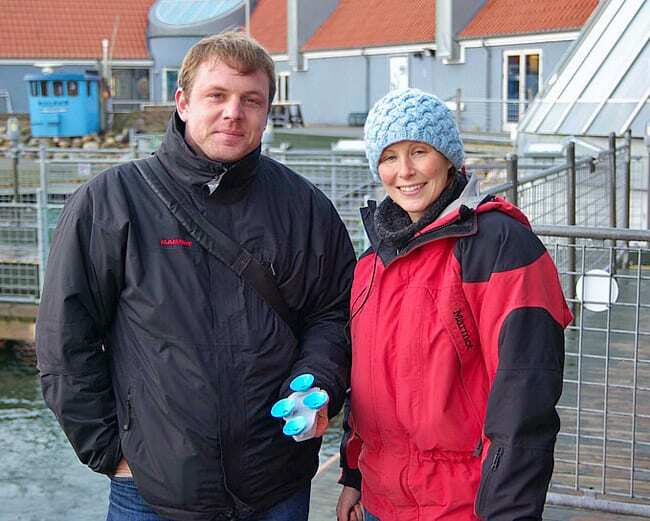 There, in 2007, Chief Scientist Magnus Wahlberg welcomed DeRuiter and happily allowed her to use the new D-tags to conduct research on the facility’s three harbor porpoises (one of the animals has since given birth). Most of this research was conducted during training sessions, when trainers fed the animals dead herring, capelin, and other small schooling fish. 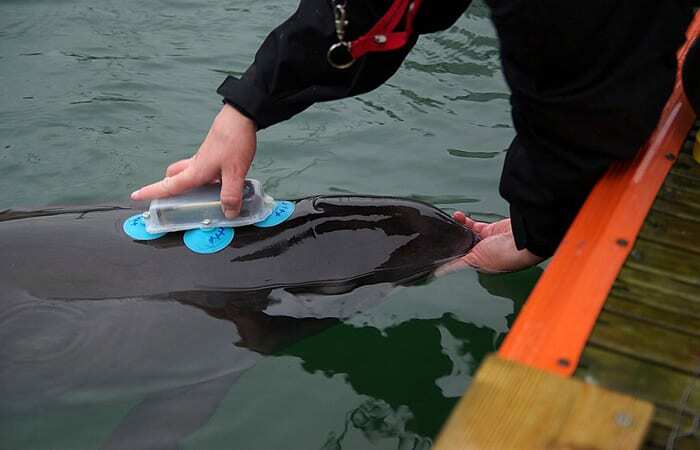 Over the course of three months, these new tags showed that they could be used to collect data on how porpoises use sound to locate and range prey. DeRuiter gathered evidence, for example, that while porpoises searched for prey, they produced periodic echolocation clicks, but then they clicked faster (in the form of a buzz) as they approached each individual fish. The animals continued buzzing even after they secured each fish in their mouths—a behavior that no scientists have witnessed in other animals that rely on sonar to hunt. While it’s still too early to explain these behaviors, DeRuiter has a number of hypotheses. Even this glimpse into the sound world of porpoises demonstrates the tantalizing potential to use D-tags to open the window wider and learn more about how porpoises operate in their increasingly noisy environment. DeRuiter, who earned her Ph.D. in September 2008, said she will continue to analyze her audio data over the next few years and try to answer these and other questions about how porpoises use sound to forage and capture prey. More immediately, however, she has an even bigger task: studying the potential effects of air gun array operations on whales and other marine mammals as part of a one-year postdoctoral research fellowship at Institut Français de Recherche Pour L’Exploitation de la Mer (IFREMER), a government-sponsored marine research agency near Brest, France. Though DeRuiter, a native of Grand Rapids, Mich., doesn’t speak much French, she jumped at the opportunity to gain firsthand experience in marine mammal management. The new assignment is certainly close to her heart: two chapters of her doctoral thesis focused on the exposure of sperm whales to air gun array sounds, including an attempt to determine whether they changed their behavior in response to air guns. So far, DeRuiter has adapted to life in France quickly; after only one week overseas, she joked that she and her husband managed to rent and furnish an apartment and put all the utilities in their names. According to Tyack, given the obstacles she’s already stared down, DeRuiter should have no problems taking on the challenges of research in a new environment. Stacey DeRuiter also received funding support from The Richard Vanstone Fund and The Paul McDonald Fye Graduate Fellowship in Oceanography.